In a year when there isn’t a heck of a lot of new product vehicle news coming out of the Detroit auto show, Hyundai Motor America did its best to supply journalists with something to write about. The automaker was busy cranking out the news releases during the North American International Auto Show media preview day. 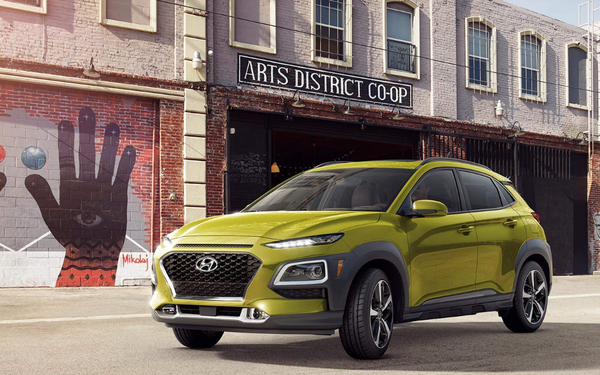 First thing this morning, the Hyundai Kona and Kona Electric CUV beat two luxury models to be named the winner of the 2019 North American Utility Vehicle of the Year by the North American Car, Utility and Truck of the Year automotive media jury. The other finalists for the award were the Acura RDX and the Jaguar I-Pace. Hyundai sister company Genesis, the luxury vehicle division of the South Korean vehicle manufacturer Hyundai Motor Group, took home the award for car of the year with the G70, beating the Honda Insight and Volvo S60/V60. The Ram 1500 won the truck category, beating the Chevrolet Silverado 1500 and GMC Sierra 1500. The automaker also announced it will be back in the Super Bowl this year with a first-quarter spot featuring Jason Bateman that focuses on its Shopper Assurance program. Roughly one year after the program was rolled out to Hyundai dealers nationwide, and after receiving positive feedback from customers and dealers, Hyundai is starting national advertising for the program. The spot is being developed by its agency of record Innocean USA and is directed by Jim Jenkins, the commercial director from O Positive who has worked on past Hyundai Super Bowl ads, including “Team” in 2013. The automaker has featured emotional ads the past two years. “Hope Detector" focused on how every Hyundai sold helps fund cancer research, while “A Better Super Bowl” was all filmed during the game at both Houston’s NRG Stadium and a military base in Zagan, Poland. “I’ve always said, you better make them laugh or cry,” Hyundai CMO Dean Evans tells MediaPost. “You’ve got to find that universal truth plus an emotional pull. We felt like we’ve done two emotionally reflective years in a row and we thought it was time to crack it up and make people laugh." Hyundai previously worked with Bateman in 2011 when the actor provided the voiceover for four ads during the 83rd Academy Awards broadcast. The biggest litmus test came when the automaker was shooting at Universal Studios two weekends ago. The crew had to stop filming several times because they couldn’t stop laughing, he says. “The subject of Shopper Assurance, we think if it’s delivered in a funny way, it should hopefully make people laugh, but really take home that we do have this great value proposition which we think is really going to resonate well,” Evans says. Finally, Hyundai announced it is launching a government shutdown payment relief program aimed at helping federal employees furloughed during the government shutdown. Under the plan, Hyundai will extend all Hyundai Capital auto loan and lease payments for 30 days for current Hyundai owners who are furloughed federal government employees. It is estimated that more than 800,000 workers are not getting paid during the shutdown. The automaker offered a similar program in 2013 during the last government shutdown.